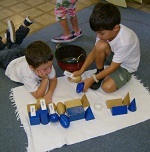 A Pembroke, New Hampshire Montessori school for students age 3 to 15--Since 1976 What is Montessori? Call (603) 485-8550 for an appointment. Please click to find out more about our school including our history, mission, vision, and all things Montessori. To find out everything about admissions including our school calendar, open house schedule, hours of operation, tuition, the enrollment procedure, our online waiting list form, and a place to download forms. To locate Green Valley School on a map or to contact us by phone, mail, or email, you can contact us here. Green Valley School has a broad spectrum of programs including a Summer Program, After School Program, Family Events, and Special Programs. Also included is our Curriculum. To visit each classroom, you can take an online tour here. Our students love to share their work. Visit the student pages to see work and field trip pictures.